Living in Santo Spirito was the best part of studying abroad. The adorable old neighborhood across the river was out of the way of tourist traps like the Duomo and Uffizi Gallery, so many Florentine families chose to live there to avoid the crowds. While my neighborhood was more residential than say the Duomo neighborhood, it still had the same gorgeous old architecture and ancient city feel as the center of town, and I quickly felt relieved and lucky that I had the privilege living here with so many locals and families. Not to mention, Santo Spirito was home to the best authentic food in Florence (in my humble opinion) and trust me, we were happy to take advantage. My roommates and I quickly found a routine in our little neighborhood and got to know our local baristas, store owners, bartenders and street vendors as if they were our neighbors and friends! We felt at home. The bar on the corner was our breakfast spot. The famous restaurant Osteria Santo Spirito was our sunday night tradition. The gorgeous chapel that housed original Michelangelo pieces was our neighborhood church! The men who worked at corner store below our apartment would greet us every day by name as we came home from school. 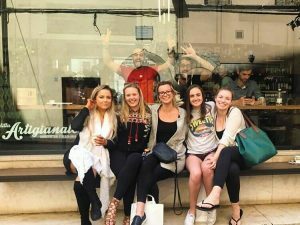 We felt comfortable testing our shaky Italian with the waiters who got to know us well, and let them practice their english with us. The more comfortable we became navigating this new culture, the more receptive Italians became to us. 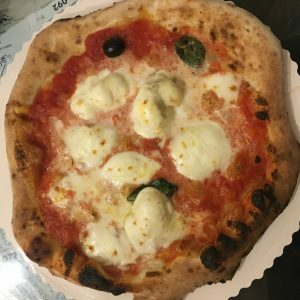 We found that even our scrappy attempts at speaking Italian made a good impression on Santo Spirito locals because they were happy to see us trying to adjust to their world, and respecting that we were guests in their city. By speaking their language and trying to get to know their culture, not enforce our own, we found a mutual respect for our neighbors that I really cherished. My friends and did what we could to break the stereotype of entitled Americans, and it went a long way! Our street in the morning! Aside from amazing bars and restaurants, Santo Spirito is a hidden gem for art stores, restoration studios, smaller galleries and local street art. 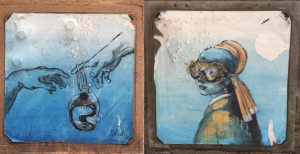 I got into finding hidden street art from an anonymous muralist who went by “Blub.” Blub painted small panels in alleyways, under signs and in unexpected places on walls detailing famous portraits like the Mona Lisa, the David and Dante wearing scuba gear. It was cool to be walking around the city and notice Blub murals in hidden spots like a treasure hunt! Santo Spirito constantly surprised me with hidden treasures. I’m sure if I had stayed there longer than a semester, there would be infinite possibilities and surprises to discover. So you get the point. 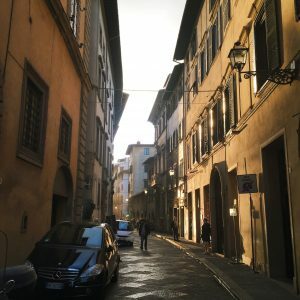 I was completely wrong about my neighborhood in Florence! Not only was I not missing out on living in the touristy part of the city, I was in one of the most lively and thriving old residential spots in the city. My friends who lived closer to school would ask to come to our place to hang out, go out, shop and eat, and were jealous of how well we had settled in and gotten to know our neighborhood. We made our tiny little corner of busy Florence our home away from home! I think my transition moving to Florence really exemplifies one of the biggest lessons I learned while studying abroad and in my life so far- that things are not always how they appear at first glance, and that it’s important to approach every new challenge with openness and adaptability, because when you let go of judgment and expectation, the world opens doors for you you never thought possible. I found a little home for myself in Florence, know that if I ever return, Santo Spirito will be my first stop. The best pizza in the entire world. Gusta Pizza was around the corner from us and we went all the time! Pro Tip: ask for extra moz!